The bacon egg. Looks beautiful, but can you really eat this thing? It's a staple of the all-American breakfast that has somehow found it's way into ice cream, cocktail drinks and another American favorite -- pie. Now the evolution of breakfast continues with a San Mateo, Calif., couple's creation aptly named the Bacone. That's a cone of bacon. If a plate is too much of a hassle for your eggs, cheese, hash browns, biscuits and gravy, why not wrap it up and turn it into finger food? That's what Christian Williams and Melissa Tillman did -- and it's a hit. "This is just a low-brow breakfast," Williams told the San Francisco Examiner. No matter how basic the idea, the self-described techie's concoction is getting some high-brow attention from gourmet eyes. His Bacone is a winning recipe that's taking him places. Williams and Tillman tried many times to perfect the Bacone. Finally, they figured out how to make all the ingredients mingle in a deep fried dream. Gourmet magazine wrote about the Bacone in a feature story titled the Gross Food Movement. Simply put, the Bacone is "Kind of like a breakfast ice cream cone without the sugar high," the article states. We assume, however, that there is a cholesterol high. Kveton is convinced the Bacone will be mass produced in no time. "I know somebody is going to start making these in a street cart or something. It's friggin' genius." Kveton raved. "I think McDonald's should be selling these suckers!" Now Williams is on his way to the Food Network with his Bacone, alongside Brian Boitano and his Bacontini, in an appearance for a series starting on the network in August. 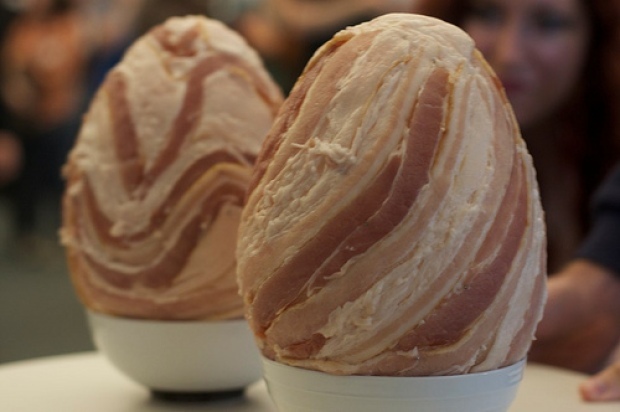 So, the next time you're looking for a way to beef up your breakfast, try it Bacone style. Forget about the calories, grab a handful of napkins and remember -- this crispy side item will never be boring.